Google’s map services are increasing important for drivers — particularly after the company scooped up smart navigation service Waze for more than one billion dollars — but thousands of miles from its Mountain View headquarters, a car from its Street View project was involved in not one but two road crashes. 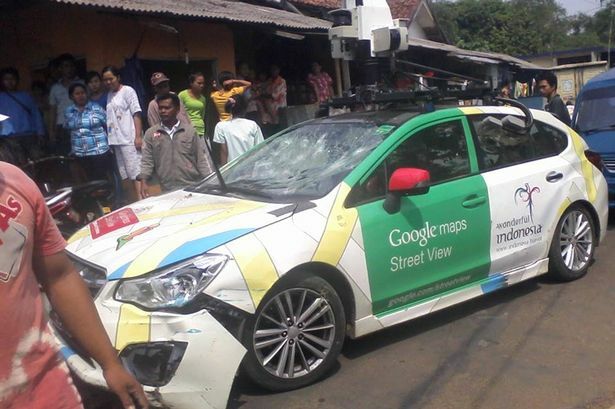 A Google car was collecting data for Street View in Bogor, Indonesia, when it hit a public minivan, the BBC reports. The Google staffer driving the Subaru, which sports the classic Street View mounted camera, accompanied the minivan driver to a repair shop, but, apparently concerned at the prospect of a bill to foot the damage (estimated at 200,000 rupiah, or around $17.50) and the bus driver’s angry reaction, he fled the scene. Here’s where things get a little crazy. Fleeing the repair shop, the Street View car drove two miles further — presumably in a panic — before bumping into a second minivan. He continued on before crashing into a third (this time parked) vehicle, which reports suggest was a van or truck, after which he gave himself up to the first bus driver who had given pursuit. We take incidents like this very seriously. We’re working closely with local authorities to address the situation. 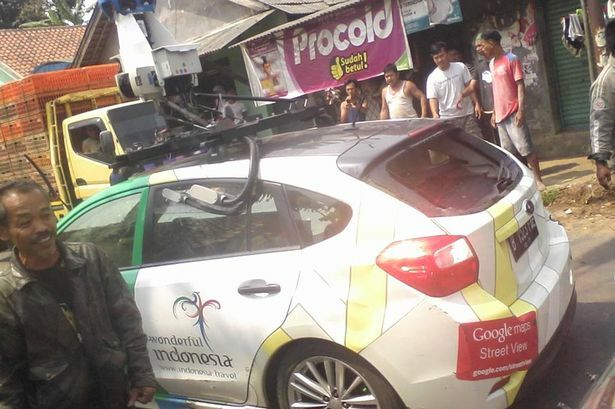 Google launched Street View in Indonesia in November 2012. Given the country’s geography — which includes a vast number of islands — it is arguably one of the most challenging places to map, certainly in Asia. Street View cars have courted controversy in the past. The company was accused of running over a donkey in Botswana earlier this year — something it went on record to deny — while Street View driver boo-boos have included crashing into bridge near Pittsburgh. Just last month, a Google Street View car was stopped in rural Thailand where locals reportedly detained the driver for a number of hours on the suspicion that he was a government spy.